I recently took a trip to Marin County, where I got to visit a handful of cheesemaking facilities. I'm still in disbelief that I got such an exclusive experience! This wasn't a look-through-the-window kind of a tour, it was the real deal, folks! It's one thing to be behind the cheese counter. But to get to be behind the scenes, watching all the cheese production magic happen right before my very eyes was incredible. One of the cheesemakers that I met said, "Milk is the blank canvas, cheese is the art" -- and that's absolute truth. Even though I was only out there for four days, we covered a lot. This is my dairy DIARY (warning: it's a long post). So, how did I get there? I'm a cheesemonger, and this trip was a special opportunity (through my work) to help me study for an exam. I had no idea where I would be staying, only that I had to schedule a flight to land in San Francisco "as early as possible" and would be meeting someone named Felice. "She has curly blonde hair," I was told. Apparently, I got there too early and would be waiting plenty of hours for seven other cheesemongers to arrive. No big deal. I brought a book called Stiff: The Curious Lives of Human Cadavers by Mary Roach to read as I waited. At last, everyone had arrived, but we still had a two hour drive to our destination. We piled into a luxury bus and carried on along a never-ending journey of winding roads surrounded by trees. Occasionally, we'd pass pastures dotted with cows, sometimes goats, and I also caught a glimpse of a single cross-shaped tombstone at the edge of a hill. 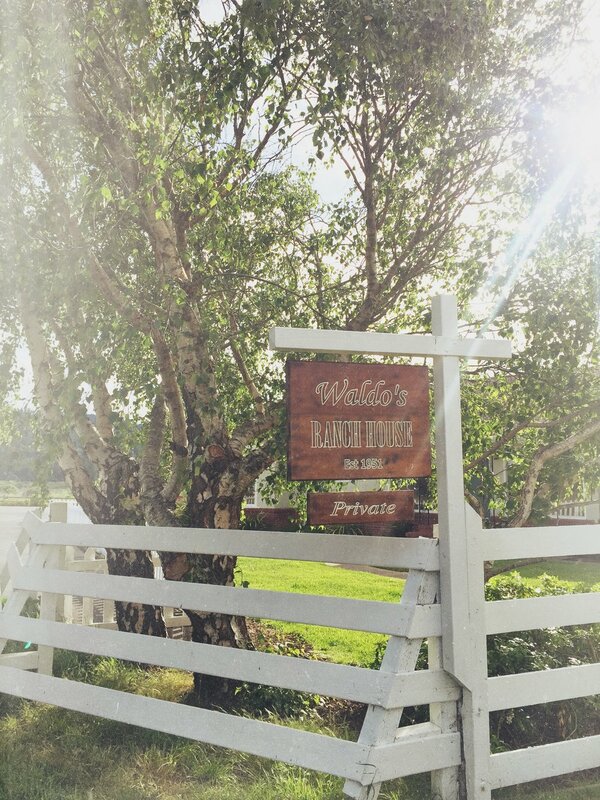 Finally we pulled up to the end of the road and a sign that read, "Waldo's Ranch House". In front of the house stood a lone apple tree, a white fence covered in lichen, and just beyond that, an old white barn in a field. Point Reyes! I've been to this place before! An old dairy barn, the view from Waldo's Ranch House (Point Reyes). Waldo's Ranch House would be my home for the next few days, and a couple of us would also be staying at Bob's House (the owner of Point Reyes Farmstead cheese!) a little bit further away. Lynn Giacomini, our host, gave us a tour and explained that her grandfather built the house we were staying (her childhood home) and it has the only pool in town! The house was actually quite large, with two living rooms, and a second kitchen outdoors, which we all gathered around as dinner was being warmed. Outside, we took turns telling our favorite domestic cheeses. Take notes! This is what cheesemongers like: Jasper Hill's Harbison, Rogue Creamery's Rogue River Blue, Point Reyes Original Blue, and Cowgirl Creamery's Red Hawk. 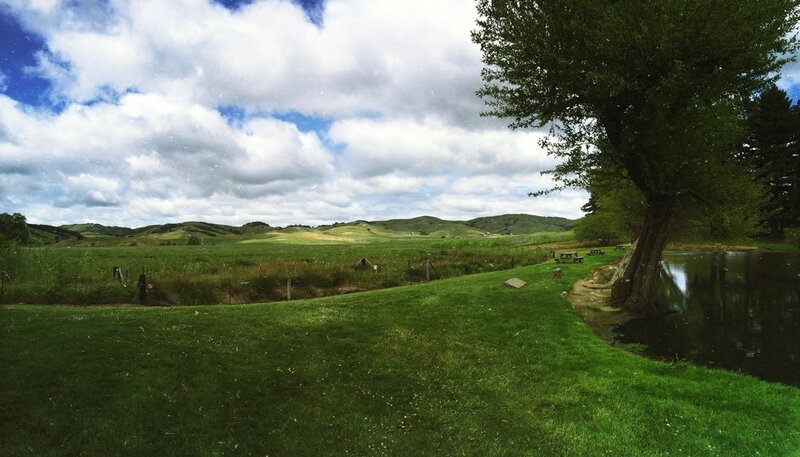 The view from Waldo's Ranch House (Point Reyes). Dinner was catered by Cowgirl Creamery's Cantina which was roasted chicken, chickpea salad, red quinoa and blueberry cake all washed down with Lagunitas beer. I also tried an oyster for the first time, it was fresh from the Tomales Bay! Lynn showed me how to take a fork to the meat to loosen it up, and then slurp it directly from the half-shell (like I mermaid, I imagined). The next morning, we met Michael for a tasting at Cowgirl Creamery (located within Tomales Bay Foods -- a renovated barn). If you're not familiar, Cowgirl Creamery makes certified organic cheeses using milk from the nearby Straus Family Creamery. In my world, their cheeses are A HIT, people looove them! They're most popular cheese is probably the luscious and buttery Mt. Tam. Many Mt. Tam lovers might actually be surprised to hear that it's not a brie-style, despite it being a triple-cream (which means it has a delectable 75% fat content). Sure, it's covered in a fuzzy white bloomy layer of Penicilium candidum, but this cheese is actually more like a gouda hybrid. How so? Michael explained that Mt. Tam is made using the gouda cheesemaking process, with cooked and washed curds and Dutch equipment. Samples of Mt. Tam were passed around for us to taste. "Triple cream is just a socially acceptable way of eating a stick of butter." Left to right: Wagon Wheel, St. Pat, Red Hawk. As Michael gave his presentation, we could watch the cheese-makers making cheese through the glass windows of the facility. Every so often, Michael would point out something interesting happening inside: "There goes a batch of baby Red Hawks!" We'd all tilt our heads and marvel at how cute those small fresh round wheels looked lined up on the metal racks. Red Hawk is a triple-cream with a washed-rind (and my personal favorite) and it's the only cheese still currently made in that facility. The rest of the Cowgirl cheese line are now produced in their larger Petaluma facility (which we would get to tour, but later). Red Hawk (my favorite Cowgirl Creamery cheese). Here's the story about Red Hawk: it was pure accident that this cheese even exists. It was an attempt to correct a mistake on a Mt. Tam rind. We can thank cheese mites, and Sue Conley, one of the Cowgirl founders. As the story goes, a nearby stilton in the aging room contaminated the Mt. Tam with the cheese mites, which inhibited the candidum mold growth. The cheese was bald and patchy (not fluffy), so, Sue tried to re-inoculate the cheese by spraying it with a solution of candidum and water. However, the extra moisture created the perfect environment for B. linens bacterium to take over. A few weeks later, the cheese was discovered to have developed an irresistible gooey texture and savory flavor! Michael then passed around samples of cheeses I had never tried before, such as Inverness (Cowgirl's version of St. Marcellin), an exclusively local cheese as it's too fragile to ship. We also tried Wagon Wheel, a semi-firm cheese, and Cowgirl's Clabbered Cottage Cheese, which I hope will be available in my area soon! 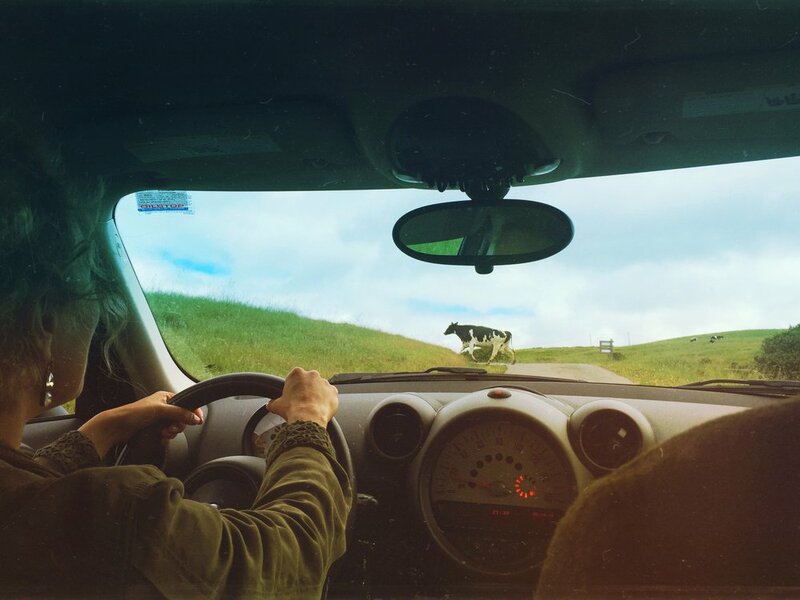 Then, Felice arrived, ready to take us to our next destination: Point Reyes Farmstead! 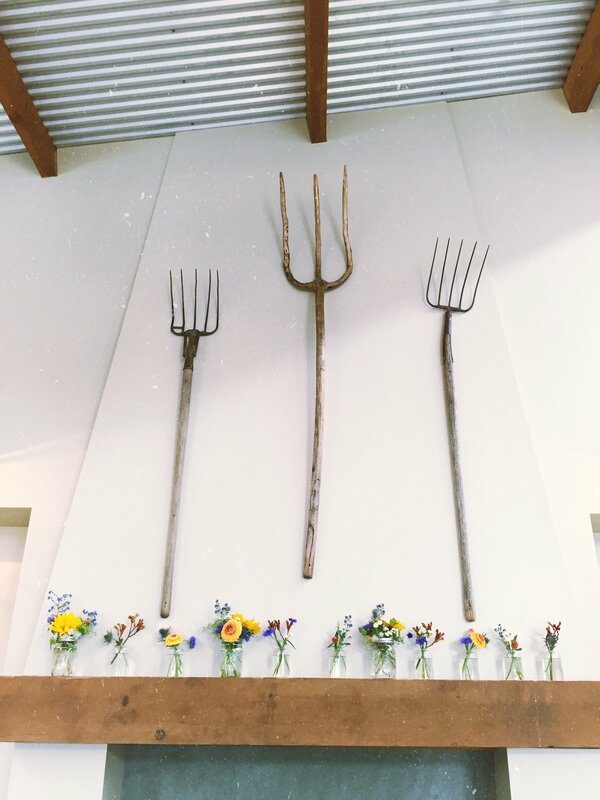 The Fork at Point Reyes Farmstead. At the top of the hill, we met Karin and Taryn, the cheesemakers who would be giving us a tour around the farmstead. "Once you start making a cheese, you have to finish it," Karin said. 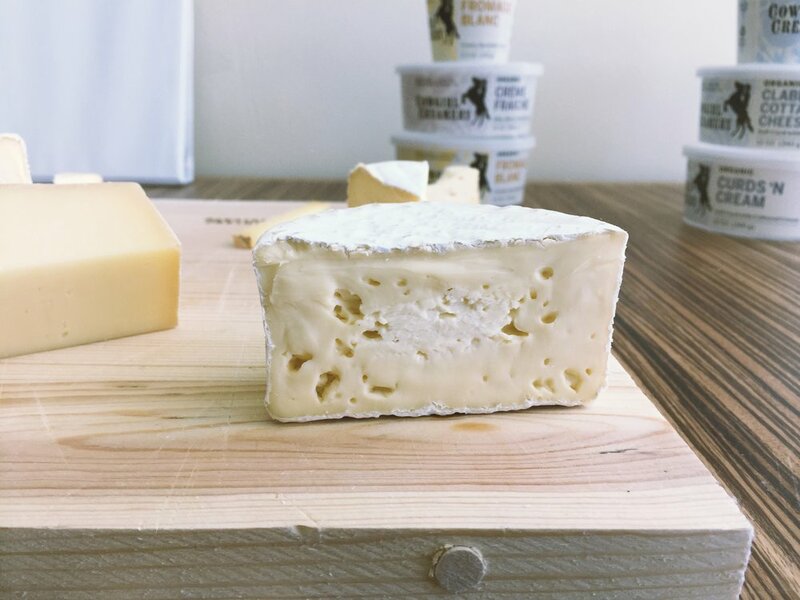 Many cheese facilities get their milk shipped from outside sources, but a farmstead cheese is made with milk from the farmer's own herd, on the farm that the animals are raised. The Holstein's we met grazing on the long grasses were all part of the herd, birthed and raised right there on the farm. As soon as they are milked, the cheesemaking process begins. Karin and Taryn took us to a room that had a large window overlooking the cheesemaking rooms. I thought this would be the extent of our tour, until Taryn instructed us to wash and sanitize our hands, and Karin passed around blue coats and hairnets, yellow latex shoe covers and vinyl gloves. We were actually going inside! The first room we walked through was cool in temperature, and smelled strongly of beautiful sharp blue mold. Racks and racks of white cheese wheels filled the room. "I call this device 'the terminator'," Karin said, referring to the piercing machine, a part-industrial part-medieval-looking tool adorned with a set of sharp spikes. The piercing tool is used to pierce holes through the wheel of cheese, which is an important step in the blue cheese process. Why? Blue mold needs oxygen to grow! Piercing allows air to flow inside the cheese. In the next room, we were shown the milk pasteurizer, and the large vats of milk, not quite yet curds. Down a the step ladder below, cheesemakers were quickly gathering curds and scooping them into molds. The molds filled with curd were stacked onto a shelf, where they would be rotated to allow the whey to drain off evenly. "What happens to the whey?" one person in our group asked. Here's the thing about Point Reyes farmstead: they recycle everything! Some cheese plants might drain the whey into a sewer or a lake, but from what I've seen, these Marin facilities work hard to be as environmentally friendly as possible. The whey is collected in a large vat, and sold to local farmers as fertilizer and livestock feed. 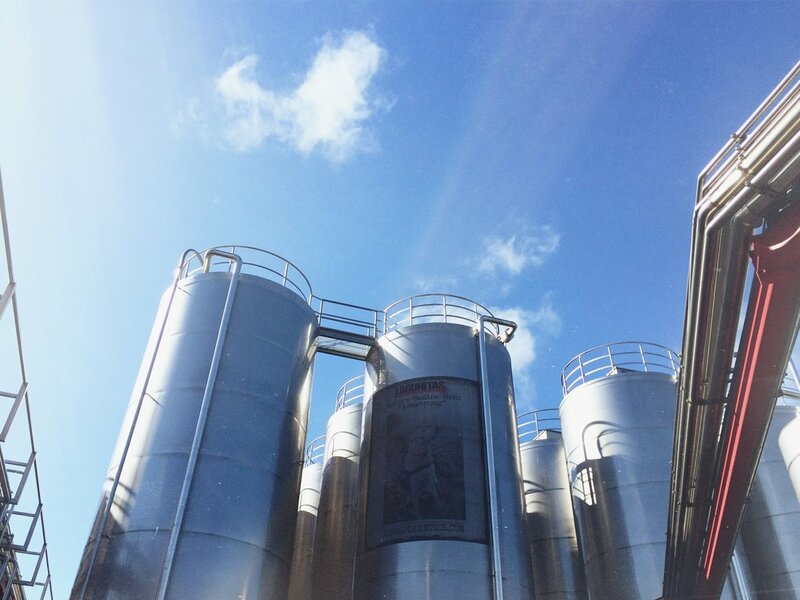 The nearby Lagunitas brewery also has a relationship with the farmstead, making beer from recycled whey, and providing animal feed with their leftover brewer's grains. But that's not all: this farmstead also has a methane digester, a system that coverts methane into energy to power some of their farmstead (the usual route, for other dairy farms, is to not recycle at all - instead, the animal waste is piled and allowed to release methane, which is harmful to the Earth's atmosphere). We were then taken into the very musty aging room, which had rows, from floor to ceiling, of wooden shelving units. The shelves against one wall were full of Point Reyes Toma wheels in different stages of age. Off to the side, a section of smaller cheeses, personal experiments, with hand-made labels embracing the names of the cheesemakers. But the room was mostly empty. We learned that Original Blue would continue to be made at the farmstead, but all the other cheeses were moved to the new, much larger, facility in Petaluma. After exploring many more rooms, and sampling young, sweet (not-quite-ready) cheeses straight from the shelves, it was time for lunch! The PRF kitchen made us grilled Toma cheese paninis and salad with apple slices and crumbled Original Blue, followed by chocolate fudge and tea. 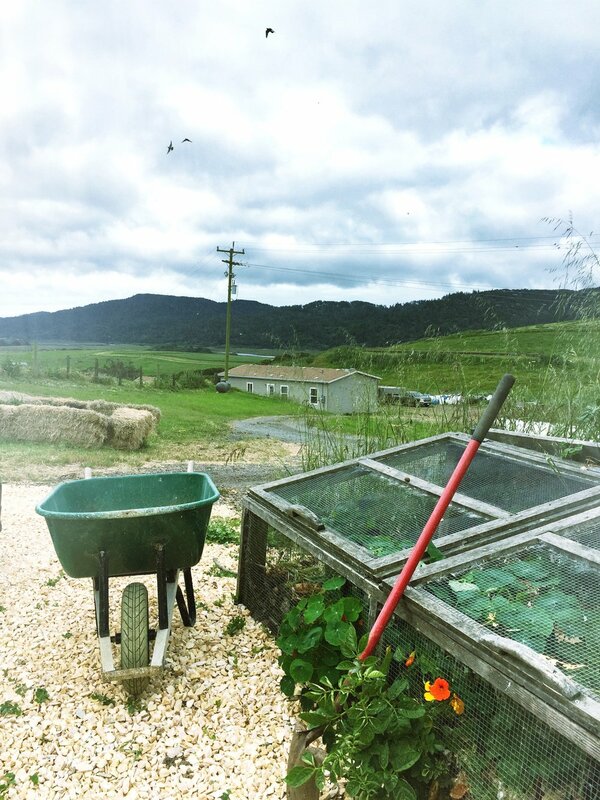 Just outside the dining room was a vegetable garden (and a natural compost bin), so I assumed much of the ingredients used in our lunch were also from the farm. Outside, we met the herd manager (who was so very passionate! 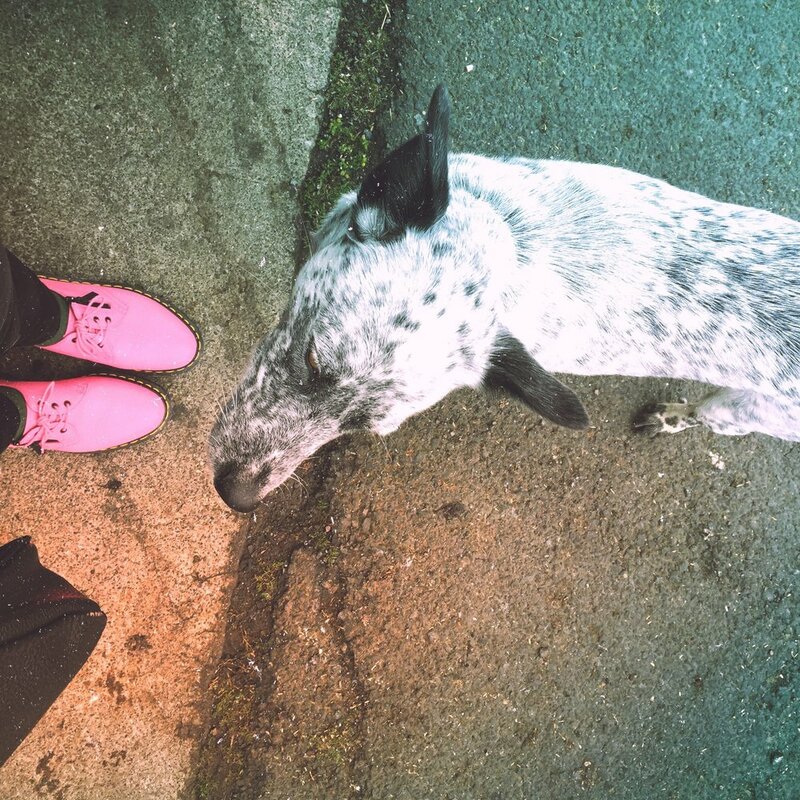 ), and Pepper (the cow dog). We were shown the feed area, and taught about the cow breeding considerations, udder health, animal feed, and the day-to-day care of the livestock. "Take care of the cow, and she'll take care of you." Cheesemongers and the herd manager! And then back inside, we were given classes on cheese transportation, packaging, distribution, and raw materials for cheesemaking. Karin brought vials filled with cheesemaking ingredients: animal rennet, microbial rennet, blue-green mold, calcium chloride, and starter cultures. She passed around the vial of calcium chloride, instructing us to dip our fingers into the clear liquid to give it a taste. By the signs of everyone's facial expressions, I don't know why I expected it to taste less than terrible. It was extremely salty, bitter, and metallic, not a flavor combination you want to linger on the tongue! I can eat this cheese plate every single day. Point Reyes Farmstead is the best! Happy cows come from California! Point Reyes Farmstead. After a long day at the farmstead, we said goodbye to Pepper and the cows, and headed back to the Waldo house. Lynn hosted our dinner and made us tequila margaritas, and Karin and Felice joined us. And we talked more cheese, of course! 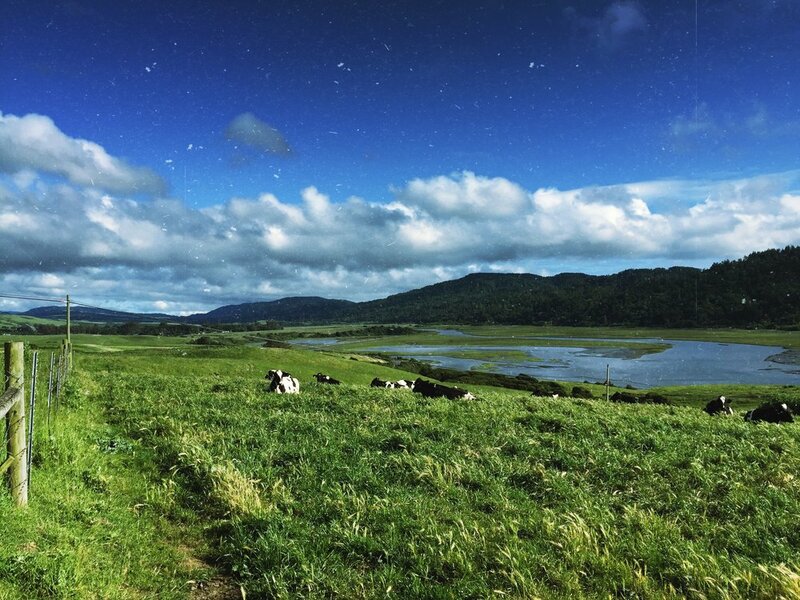 Cows and pasture at Point Reyes Farmstead. That evening, as the sun set, and the birds swooped lower and the frogs chirped louder, we took a walk to the old saloon. There was an eerie feeling in the air. Maybe it was from passing the yard full of strange towering antler totems. Maybe it was from breathing in too much mold in the aging rooms earlier that day. Or maybe it was because the nights here are darker than I'm used to. And here I was, sitting in the red glow of a creepy saloon (and I'm certain someone's been murdered here)*, drinking a cider called "the hatchet", even though my belly was already uncomfortably full, having flashbacks of all the cheese plates that I practically inhaled throughout the day... all while the constant cowbell of Prince's Cream plays from the jukebox. "GUYS. WHAT IF... we were sent here... to be fed as much as possible, to later be milked?" *A few days later, after talking about the saloon, another local revealed that someone in fact had actually been murdered there before. 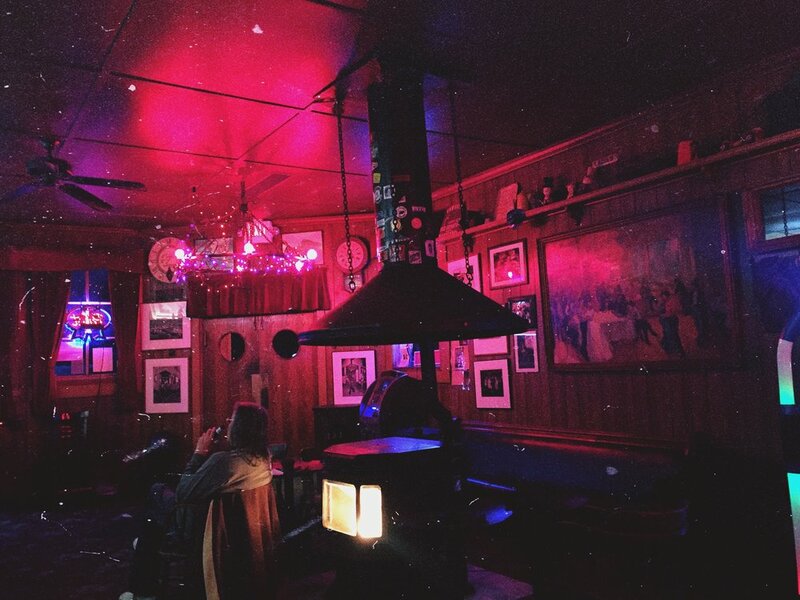 By the way, the saloon isn't actually creepy, I was just feeling weird from practically overdosing on cheese that day. Okay, imagine Willy Wonka's Factory, but for goat cheese - that's what Laura Chenel's factory is like. 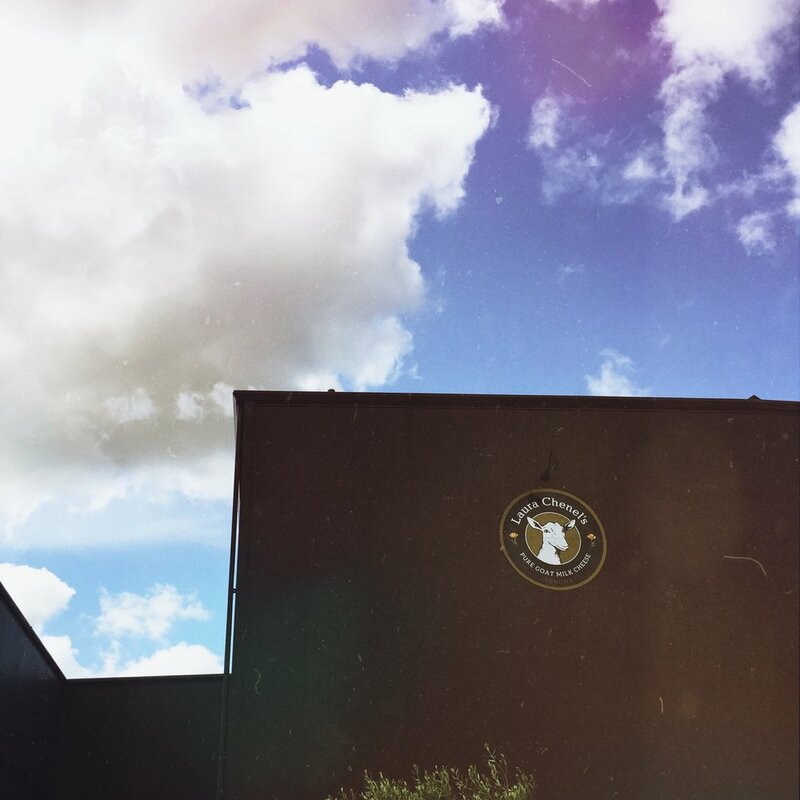 While, I can't go into too much detail about what goes on inside (we signed confidentiality forms), the factory is highly organized and their process in making fresh, made as it's ordered, cheese is totally efficient. The factory sits across from a vineyard. At the edge of the vineyard, we were told, is where Laura Chenel (now retired) used to make her goat cheese, but the historic buildings are now all gone after burning in the Sonoma wildfires just less than a year ago. Yes, another cheese tour! This time, with Marin French Cheese Co., the oldest operating creamery in the United Sates (founded in 1865). This cheese company all began with Breakfast Cheese, a fresh brie-style that became a food source for dock workers after an egg shortage (caused by a chicken epidemic). Inside the cute gift shop, we met Zach and Amelie, our tour guides. And then once again, we suited up in protective outfits and toured the facility, watching the cheesemakers work their magic, taking in the cool atmosphere of the bloomy-room, becoming entranced by the blink-of-an-eye-FAST packaging machines. Afterwards, we took a food safety class with Michael Kalish (one of the Cheese Twins), and a cheese class and tasting with Amelie. By the way, my favorite cheese in this tasting is the Schloss, a stinky washed-rind that oozes with big meaty flavor. I later took a package of Schloss home with me, but before boarding the flight, security took me aside to swab my cheese. So if you're ever going to carry cheese on a flight, be prepared for a longer security check! The day ended with an evening dinner at Osteria Stellina in Point Reyes, with Zach and Amelie, where we drank wine and passed around bread and olives, nettle pizza and pastas. I'm truly grateful for everyone that was gathered around that table, and all the food and moments we shared. 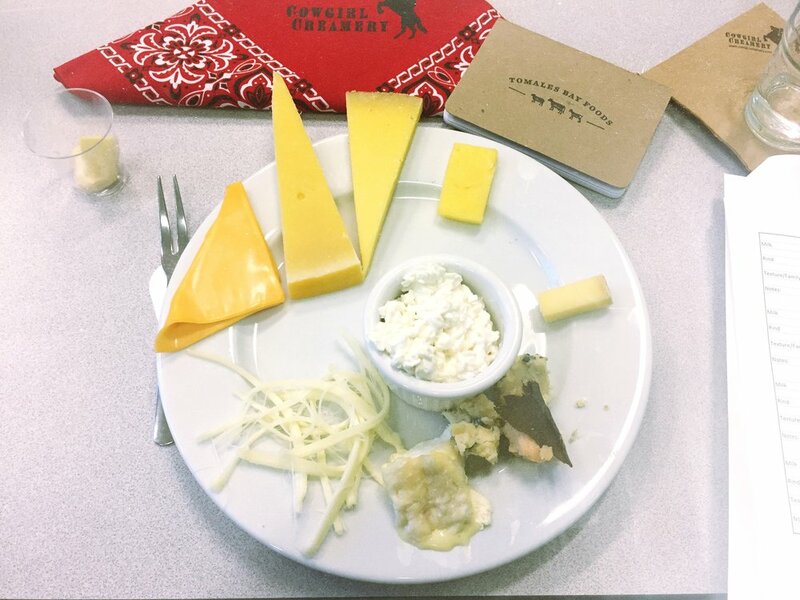 The fourth day would be our last day on this cheese-filled adventure, and Karin from Point Reyes Farmstead really made it memorable! 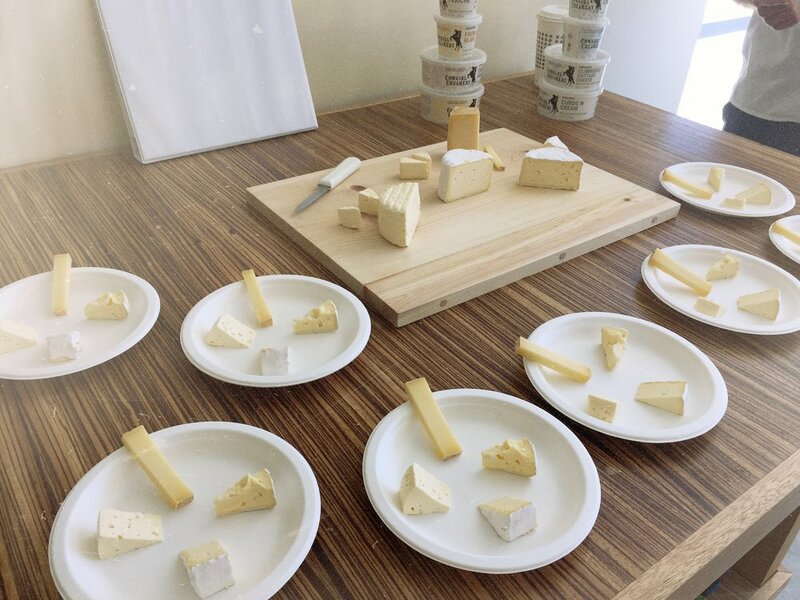 We met her at the new production facility in Petaluma for a tour of the milk receiving area, the separate test lab, and of course, the cheesemaking rooms! Cheesemaking, from what I could see, has it's physical demands. Cutting curds requires the physical ability to reach and extend (especially if you're short), flipping wheels and stacking trays is heavy lifting -- and doing this, repetitively, can pretty much be considered a cross-fit workout. And then there's the cleaning, lots of it! "Cheesemaking is 20% making cheese, 80% cleaning". 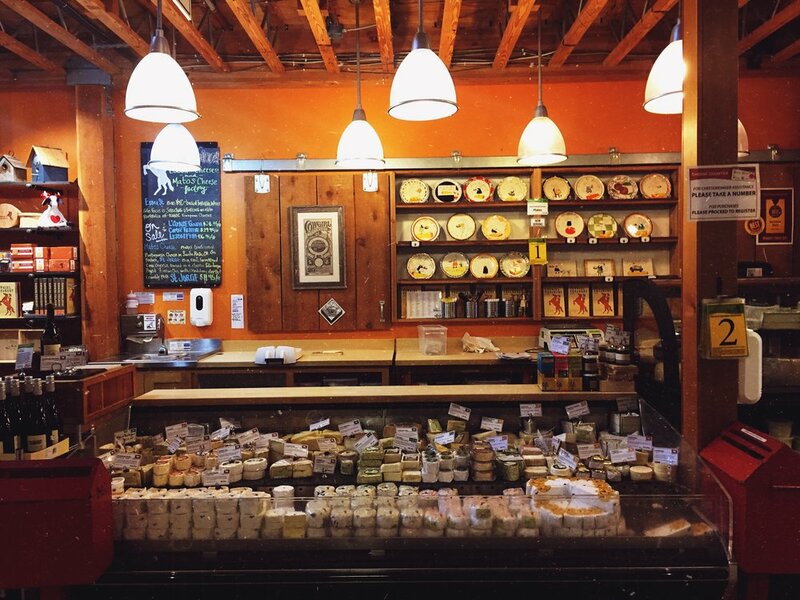 Have you tried the Point Reyes Aged Gouda!? IT'S INCREDIBLE. Think: crunchy crystals, nuts and sweet creamy butterscotch perfection. It just won GOLD in the 2018 California State Fair! HOLY. With that said, Karin gave us an exclusive tour in the gouda-making room. She had us feel the fresh vat of curds by hand to get a sense of when they are ready. And the best part: she had us turn the gouda wheels! We were all a bit timid about handling the precious, young wheels, but they were surprisingly sturdy and quite elastic (after leaving imprints of our hands, the surface would instantly return to it's original smooth round shape). We all took turns flipping the wheels and placing them on the vertical press -- but certainly not as fast as Karin! We met Peg Smith and Sue Conley -- the founders of Cowgirl Creamery! Oh, but they are so much more than that: they are pioneers of California's artisan cheese movement, through Tomales Bay Foods they support their community, and they are activists, supporting the environmental stewardship of the land (read: Marin Agricultural Land Trust). Why didn't I get a photo!? We also met Deb and Emily. Emily gave us a tour of the distribution center, and Deb gave us a class on cheese categories! She prepared cheese plates for us with which we were to use our senses to identify: milk type, rind type, and classification based on processing. It was actually fun tasting, for the first time in years, American processed cheese -- we were all quite surprised by how sweet it was! Cheese classification tasting plate. Yes, that is a Kraft single. Then it was time for lunch, which I skipped because I scarfed down my entire cheese plate (and I knew there would be more later). But just so you know, it was local pizza made with Cowgirl Creamery's Wagon Wheel. 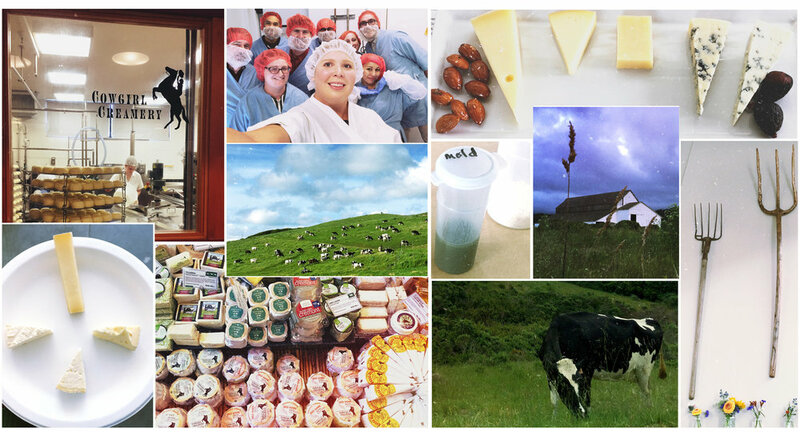 From there, we visited the larger Cowgirl Creamery production facility, where we met Maureen. Maureen showed us a floor map (the place is huge!) and then took us around the hallways which all had windows that looked into the cheesemaking rooms. Counter-clockwise: Wagon Wheel + Mt. Tam at a few days old, ten days old, and fifty days old. Eric, another cheesemaker, led us on a vertical tasting of Mt. Tam. We tried the cheese at different stages of ripeness. Mt. Tam at a few days old has the salt concentrated in the rind, but the paste is mild and bland. By 10 days, the salt has distributed throughout the cheese, but since it's still young, is tart in flavor. In contrast, a Mt. Tam at 50 days old has developed a cream line and is pungent with much more flavor development. We asked Eric what he thinks is the optimal stage of Mt. Tam, and he responded with humor, "I just eat whatever's leftover in our walk-in". It's all good! And then it was time for the grand finale: a tour of Lagunitas Brewing Company! Lagunitas Beer Tasting. "Whey Far Out" on the right. Cory was our tour guide, but first, we all picked out something to drink (I got the Dark Swan, a gorgeous purple hopped sour -- so smooth). Then we had a tasting in the VIP tap room, including a beer made from recycled whey from the Point Reyes Farmstead (it's unofficially called "Whey Far Out"). Cory showed us around the production areas, let us smell the hops, and then we went outside to eat food and drink more beer! The night ended with a drive back to Point Reyes, more beers and lots of review. Then it was time to go back home. 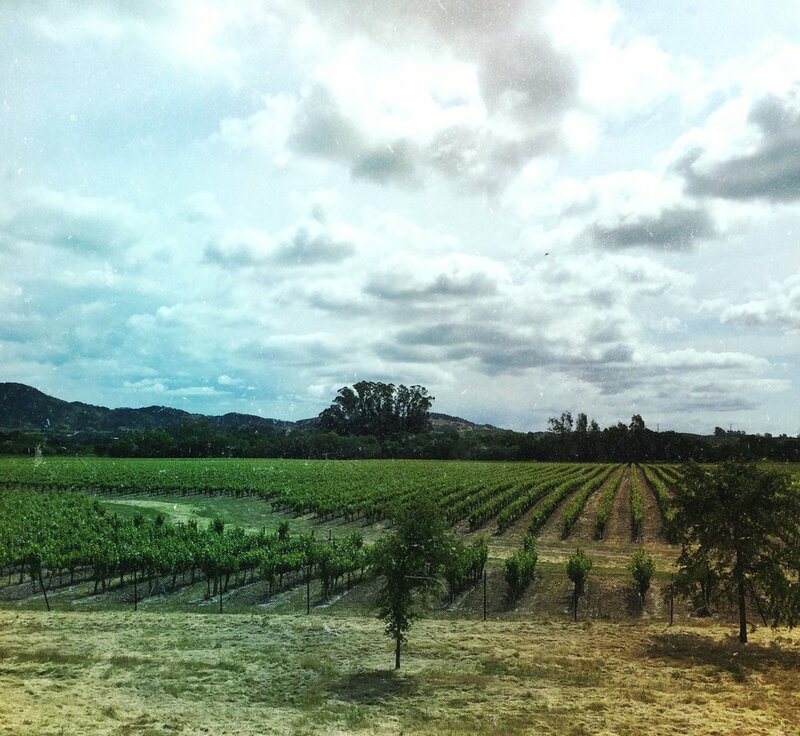 I hope my California cheese travel diary inspires you to eat more good cheese! P.S. I was so inspired by the working landscape of Point Reyes, that I started reading this book called The Paradox of Preservation by Laura Alice Watt. Check it out.